More than 87% of people round the world now own some kind of mobile device. That’s a cool 6.3 billion mobile users out there. Smart device use continues to grow year on year, with over half the world’s population now tapping, swiping and Snapchatting (probably) their way through the day. With such a massive active user base out there, mobile UI design is an integral part of product design and development. Whether design teams follow a mobile first, native app or adaptive design approach, they all agree on one thing – get mobile right or get ready to fail. But mobile UI design comes with its own special challenges. Small screens and big fat human fingers are not a match made in heaven; unreliable mobile connectivity can create user frustration; high interaction costs impact on user success rates; unpredictable context of use complicates the matter. Building an interactive prototype means you can design and test with mobile users in mind from the beginning. Justinmind has all the features you need to bring your mobile app to life. Check them out below. 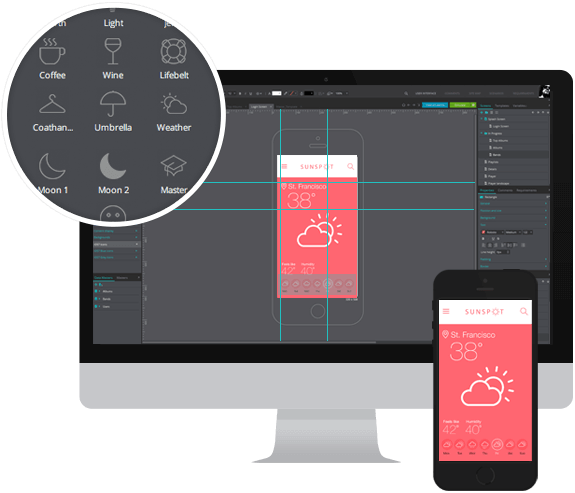 Download Justinmind today and build incredible web and mobile wireframes! 10 years ago, UI designers didn’t give gestures a second thought. But then Apple released their first iPhone and UI design changed forever. Now, users have a tactile relationship with their devices. This has led to a whole new field of mobile UI design – gestures. Gestures are the finger movements we use to interact with an app. Swipe, tap, zoom – we couldn’t interact with mobile devices without them. As Nick Babich says, “gestures are the new clicks.” So when designing a mobile UI, you need to be able to test drive these gestures. An advanced prototyping tool like Justinmind lets you do just that. You can build mobile app prototypes that you can swipe in any direction, that you can tap, hold, pinch, rotate, whatever you need. These interactive gestures are linked to real events in the mobile prototype, simulating exactly the feel of a fully designed app. To find out how to use gestures in your mobile UI prototypes, check out our tutorial. Do you remember when user interfaces were just static pages on a screen, bereft of animations or dynamic elements? Do, us neither really. Animated interfaces have become the norm today, and are a key way of communicating to users that something is happening behind the interface. A key element of this kind of mobile interaction design is the transition. A transition is an animation that moves content around an interface, making the app more intuitive and improving user experience. It’s not possible anymore to produce static wireframes and tack transitions on as an afterthought, says Adrian Zumbrunnen in Smashing Magazine: they’re integral to the modern mobile user experience. Experiment with transition effects such as Slide, Fade, Bounce, Rotate in Justinmind mobile prototypes. Then add parallax scroll effects, collapse and expand menus, dynamic carousels – whatever you need to convey to users the functionality and features of your mobile app. If one transition effect doesn’t have the effect you intended, swap it out for another. It’s only a prototype after all. The rise of mobile has also brought about a ton of new interface elements and icons. Toggle wasn’t something people did with a keyboard or a mouse. Similarly, the app explosion has led to a new language of iconography and (often branded) symbology. Just take the Google Map pin – everyone knows what it means, and it would be pretty dumb to use an alternative location icon. Like Steve Krug says, don’t make users think! Luckily you don’t have to reinvent the wheel every time you design a mobile app prototype. Prototyping tools come with pre-built UI libraries full of specifically designed Android and iOS elements. You can drag and drop native menus, tabs, buttons, title bars and more into Justinmind’s canvas and edit the elements to match your mobile prototype specifications. Imagine you built a really cool mobile device app, but you had to view the prototype in a browser. That would kind of defeat the purpose of adding mobile effects and elements, wouldn’t it? That’s why Justinmind has test-on-device functionality. You can test iPad, iPhone or Android mobile designs on the devices themselves, as if they were real apps. Once you’ve built an interactive mobile prototype just share it to you Justinmind Online account and view on any device. You can even capture a change in the orientation of your mobile device and hence simulate responsive design. You’ll get a true feeling of how your ideas are working out and where you need to iterate. Simulation on any device is also a great way to present mobile app designs to clients or potential investors. Follow our tips for presenting designs better. Don’t stop just with simulating your design on a mobile device. To truly bring mobile UI designs to life you need to run them past users, the sooner the better. Early stage user testing, even if it’s rough and ready guerilla testing with the maintenance guy in your office, is an incomparable way to see how users react to and interact with your ideas. 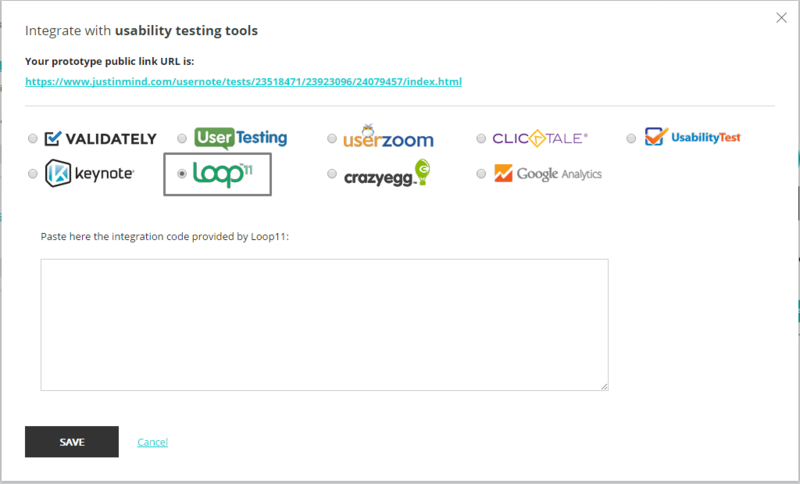 According to NN Group, “usability requirements increase as the platform shrinks. Smaller screens equal bigger needs to test your design with real users, because there are more ways for users to fail.” Which means that you have to test your mobile app prototype, no discussion. Mobile user experiences are defined by interactivity and dynamism. We touch, talk to and even wear our mobile devices. That means that mobile UI design has to incorporate these interactive elements from step one of the UI design process. A solid prototyping tool will let you build mobile UIs that look like the real thing, from inception to development.